As we celebrate 20 years of sharing this love letter from God to the world, we have re-introduced the original Father's Love Letter video accompanied by Brian Doerksen's song, Faithful Father. In the early days, the limited bandwidth of the Internet could only handle a small Flash version of the video because of the millions of people that visited our website to watch it. This is the first time we have been able to share it in its entirety on the Internet. The song, 'Faithful Father' is used with permission of Mercy/Vineyard Publishing. To mark 20 years of sharing the Father's Love Letter in January 2019, we have created a 20th Anniversary Edition of the much loved Father's Love Letter video that is available as a free download below. Feel free to download the HD video (120 MB) or CD quality audio (6 MB) files. 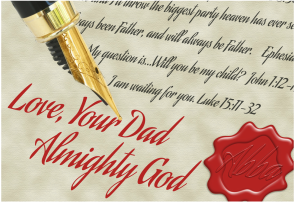 Download the Father's Love Letter in many different formats including greeting cards and posters on our English language media center page. Thousands of people around the world have shared the Father's Love Letter. We invite you to come along with us on this journey and share the love! Everything on our website is completely free of charge but a few independent distributors offer a few resources for sale. Millions of children around the world have been impacted by this free comic strip cartoon version of the Father's Love Letter that is available to be downloaded in letter, tabloid, A4 and A3 sizes. ​It is great for Sunday School, VBS and children's outreach programs. We have heard that even a lot of adults like it too! written by the author, Barry Adams.